The products are stocked by wholesalers in Australia and New Zealand, and Austral Plywoods targets architects and interior designers, and has been involved in a number of notable projects including the Brisbane Supreme and District Courts, Perth Arena and Melbourne Recital Centre. The supply of the Hoop Pine resource, pruned and harvested, plays an important role in supplying Austral Plywoods with superior grade product for manufacture. For Austral Plywoods, Responsible Wood is more than just a ‘trust mark’, through Responsible Wood’s Chain of Custody it provides Austral Plywoods with a licence to support responsible forestry. 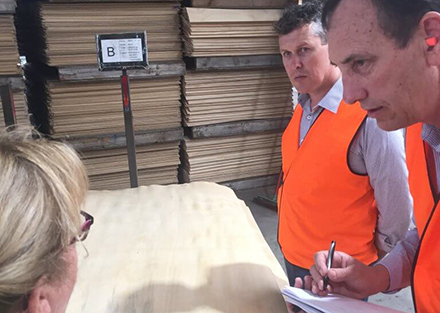 Austral Plywoods opened its doors for Responsible Wood directors Mark Thomson, and Willie van Niekerk, and Jason Ross – marketing and communications officer, to tour its facilities. Brothers Scott Matthews and Stuart Matthews are joint CEOs of Austral Plywood which employs more than 50 staff. The company competes with domestic and imported manufacturers of plywood product. “Competition in the market is strong with imported product competing against local manufacturers,” Stuart Matthews said. According to Responsible Wood director and architect, Mark Thomson “this distinction is widely misunderstood by well-meaning specifiers of timber based products”.